A circular walk from Leck Fell House in the Yorkshire Dales. The walk heads up across open moorland to Gragareth, via the '3 Men of Gragareth' - 3 large cairns guarding the hill! Then from there a path is followed along the moorland ridge to pass over Great Coum and then around to Crag Hill. The broad ridge offers wonderful panoramas of the Dales and round to the Lakeland Fells. The walk then drops down to Ease Gill via Bullpot Farm, before climbing back up to Leck Fell House. Note - not all the paths are well marked. Parking: Leave the A65 at Cowan Bridge and follow the sign for Leck. Keep on the lane through Leck and follow the metalled road for another three miles out on to the open Fell, to a parking area where the road ends a few yards short of Leck Fell House (grid reference SD 674 790). Leave the parking area and pass through the gate just short of Leck Fell House. About three hundred and fifty feet above the lane on the horizon stand three cairns, known as the Three Men of Gragareth. Either take the direct steep route up to them, or walk along the track for a couple of hundred yards past Leck Fell House then double back to the Three Men, so that the slope walked across is not as steep. There are excellent views from here across to Barbon Fell and out towards the Kent estuary. From the Three Men continue heading straight up the hill (almost due East) in the continuation of a line passing from Leck Fell House through the Three Men. Keep on this course for about half a mile over peaty grassland until the concrete triangulation point on the summit of Gragareth is reached. There is no real path to follow from the three men to the summit of Gragareth. There are excellent panoramic views from here. Besides being able to see the Lakeland hills to the north and out to the sea in the West, Ingleborough and Whernside are now very prominent over to the East. Leave the triangulation point along a wide grassy track in a north-easterly direction heading along the wide ridge into the horseshoe itself. The path very quickly pulls in alongside a wall which is followed most of the way round to Great Coum and Crag Hill. Where the path initially pulls in alongside the wall, there is a stile that leads to the far side. Ignore this and keeping to the western side of the wall, a few yards on pass over a further stile and continue ahead keeping to the western side of the wall. There are signs all around here of how the landscape has eroded over the years. The path is relatively flat for about the next mile before starting to climb a little steeper as it goes up Green Hill. The path at one stage veers off about thirty yards away from the wall to pass through a wooden gate, but soon returns back to the wall. Keep ahead by the wall until the wall in the far corner of the enclosed fell turns left (westwards) at a right angle. Just over the wall here is the highest point on Great Coum (687 metres). Keeping to the inside of the wall, follow the wall along now for about half a mile to Crag Hill. Over the other side of the wall there are excellent views of the Howgills and the Lakeland Hills. At the summit of Crag Hill, just on the far side of the wall is a triangulation point. Leave Crag Hill, again keeping to the inside of the wall, which after a few hundred yards is replaced by a fence. After about four hundred yards, the fence deviates off to the right, keep ahead here following a continuation of the original line of the fence over the brow of the hill, on a line for Leck Fell House which is visible in the distance. The grassy track, a little indistinct in places, heads downward towards a tumbled down wall. The path hits this wall at a little cairn (grid reference 683822). Without crossing this tumbled down wall, the path turns to the right and keeps a few yards inside it as it heads downwards towards Bullpot Farm, which is visible about a mile ahead. After about half a mile, a wall surrounded by a fence comes in to meet the tumbled down wall from the left at grid reference 675818. Cross over the tumbled down wall here and head alongside this wall almost due south, again heading almost in a straight line for Leck Fell House, which is visible on the hillside about a mile and a half ahead. Follow this wall again across mainly peaty wet ground for about half a mile, then just after a path joins from over a stile to the right, the path descends quite steeply for about forty yards down to the water of ease Gill below. The Gill is crossed using a wooden footbridge at grid reference 675805. From the bridge though, be sure to admire the eroded and sculptured banks of the stream. Once over the footpath, pass over the wooden gate about twenty yards ahead and turn right, back steeply downhill for about twenty yards to the now dry riverbed. A few yards diversion back around the dry bed to the right soon explains where all the water has gone to. From the sculptured riverbed above the water cascades into a dark, deep cavern, which appears to simply drink the water. From here, head away from the waterfall down the dry, tree lined riverbed. 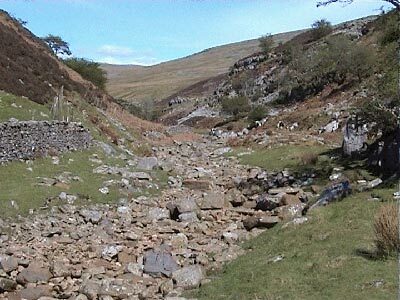 After about half a mile down this dried riverbed, there are four small stone wall segments, probably the remains of a building on the left-hand side of the riverbed. Shortly after this a wall climbs out the riverbed at grid reference 664802. Go a few yards past the wall and take an indistinct path steeply upwards alongside the wall. Follow the side of this wall now for the final half a mile back to the parking area.